This is a very light tube that comes with an attached lanyard so that you can easily wear it around your neck. Apart from its lightness, its portability is enhanced by the cord that you can use to wear around the neck. 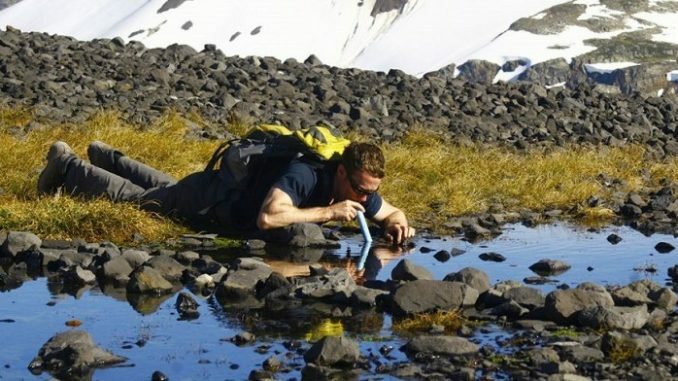 What makes this deal even better is the fact that it is easy to use; just slip off the caps then you can drink water from any source that you can get. It gets rid of more than 99% of protozoa and bacteria which may be present in the water and it can process up to a remarkable 264 gallons of water! After you are done with drinking the water, you simply blow through it so that you can flush out the residual water so that you help in restoring the optimal flow rate. Note: This gear will not filter out any chemicals or heavy metals. Berky is the most recognizable name in the water filtration industry all the way from early 19th Century in the Victorian era! This filtration equipment uses a highly efficient gravity-fed ceramic filtration mechanism which wipes out more than 99% of viruses, protozoa and bacteria that can be found lurking in the water. Apart from that, it can also get rid of other contaminants in water such as chemicals. The filtration elements of this gear clog up in the end but replacing them is quite easy. You may dig deep into your pocket to acquire this tool but the efficiency is worth it! This is rather small in size, a mere two ounces but it is an exceptional powerhouse in water filtration. It can filter up to a whopping 100,000 gallons of water. What’s more, it has a straw and a drinking pouch and if you choose to, you can just drink from right through the filter. It does away with microscopic nasties such as protozoa and bacteria. However, just like the LifeStraw Survival Water Filter, it doesn’t filter out chemicals or heavy metals. In case it starts getting clogged, you can simply backwash it with some clean water to restore its optimum flow rate.